The day you push your twins outside for the first test drive in their new buggy, you embark on a new role in society – mobile drop-in centre. You may think you are the same person as before, just going about your business in town but your double bundles of joy have changed the stakes completely. Barriers come down, people open up. Whether you are ready for it or not you are wheeling around the conversation starter of the century. 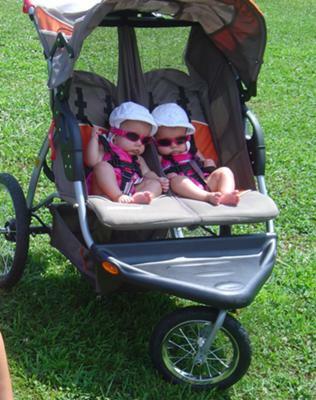 Memory lane: Other twin parents have an inbuilt twin radar that never goes away. Seven years on I still stop in my tracks every time I see twin babies. Where once I was on the receiving end, now I’m the one who has to grin foolishly and stare, carried back in an instant to those golden days of babyhood, times two. If there’s an opportunity I strike up conversation. ‘Congratulations, how old are they? I have twins myself.’ Some of these conversations are short. Others get long and involved. The oldest twin mother I ever chatted to had sons in their fifties. Another time I remember talking to a security guard in an art gallery about his twin girls, as if we’d known each other for years. The best stories older twin parents will tell is the surprise they had at the birth when a second head appeared. Hands full: A standard comment you will hear as a twin parent is some version of “you’ve got your hands full there”. There’s some truth in that but it’s tempting to point out that, more importantly, your heart is full. If your babies are premature, you might want to lie about their age to keep the reactions down. If you happen to have different sized twins, this will also be a talking point. Sad stories: Twin pregnancy is by definition high risk and was more often seen as a burden than a blessing in the past. One thing I didn’t expect was the number of sad stories people told me about twins. A woman we once rented a holiday home from told the story of her twins’ birth 40 years before. They were too small to live and were left in a room in the hospital to die. Another woman who stopped me in the street one day in Fribourg started out by saying she too was a twin but then revealed she didn’t grow up with her siblings. She was given away to a children’s home because her mother couldn’t manage. She never understood why they chose her, and the rejection hurt her still. Another lady at a garage told me her mother had given birth to three sets of twins but only one child had survived. Kindness of strangers: One of the lovelier sides of having twins is the kindness it brings out in people – from the people who reach out to take a baby onto their laps in the bus, to the other Mums at the playground who will run to pick up your fallen toddler, when you are struck trying to get the other one down from the climbing frame. One incident stands out for me. There was an old lady I used to see around town, always dressed in the same shabby coat and old shoes. One day, waiting at the lights to cross the road, she pressed a ten-franc note into my hand and urged me to buy something for the twins. Before I could protest she was gone. If your twins are brand new and you’re getting up the courage to take them out into the world for the first time, don’t be afraid. There is a big welcome waiting for you.